It’s the tone, the vibration that’s behind the words that are spoken, that is what you experience. 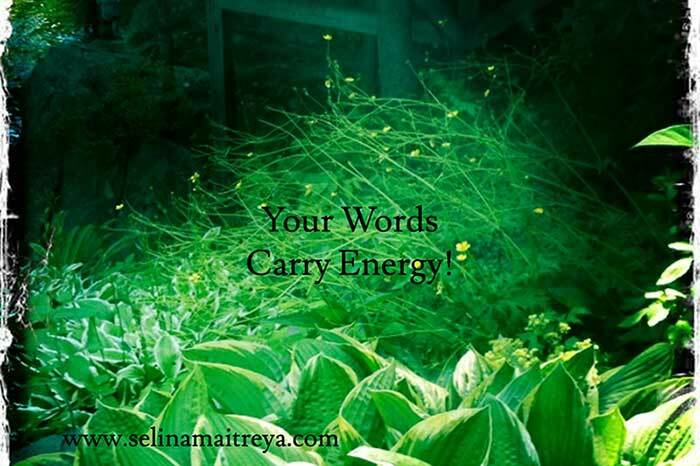 The energy, is your key as to whether their words carry the low vibration of irritation or the high frequency of care and concern. The beauty is, you don’t even have to think about it. You know automatically when listening to the sound of another’s voice what frequency they are holding. I’ve shared with you many times that having an abundant life is the result of moving through the world moment to moment from the high frequency vibration of love. While we may have pivotal moments where we notice the vibration we’re holding, it’s truly in the smaller moments, where much work can be accomplished. Your words are a wonderful place to begin to observe your frequency and shift it when needed as they are always with you, and are often the expression of your unconscious mind. Certainly speaking kind words to others is an important practice, but you might be using words daily without even knowing that they represent low vibrational frequency. How often do you say “I’m sorry” when you believe you’ve done something that needs rectification? Most of us do it all the time. We’re raised to say “I’m sorry” if you bump into somebody in the store, or on a subway platform. It’s practically an automatic response. When you say “I’m sorry,” you’re working from the energy of lack. Working from the frequency of I did something wrong, I wasn’t enough. Each time you say “I’m sorry” you’re reinforcing the lack that you’re apologizing for. Now, I believe that accepting responsibility for my actions is incredibly important. But it’s how I do that, the frequency that I hold as I seek to rectify any behavior that doesn’t serve that truly matters. So I’m going to suggest that instead of saying “I’m sorry” you approach the situation from gratitude. Let’s see how that might work. Maybe you are rushing to meet a friend. You got a late start, and the traffic is horrendous. As you sit stuck in bumper to bumper traffic, you notice that you’re 10 minutes late, and then 20 minutes late. You notice that your state is getting more and more agitated as the minutes tick by and by the time you get to meet your friend they’ve been waiting for 30 minutes and you’re a stressed out mess. When you finally arrive, you automatically start to say how sorry you are, and you repeat to them all the situations in the last half-hour that caused you to be late. In reviewing all of the reasons for your tardiness, you are fueling the present moment with the negativity of what you’ve just experienced. No wonder why you can’t relax once you’ve arrived! Instead, lose the stories of the last 30 minutes, and speak from the high vibration of Gratitude. As you thank your friend for their patience and tell them how excited you are about being with them, you are in an open state. 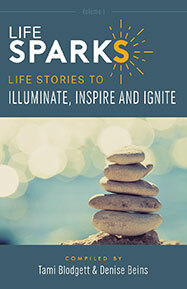 In addition, you are not repeating the past stories of pain, you’re leaving the low frequency of the last half hour of stress behind, and you’re moving right into your appreciation for them and into your excitement of being in their presence. Gratitude and excitement are physical manifestations of love and a when you respond from these states of abundance, you’re taking the situation that was low-level irritation and transforming it into grace. That’s beautiful!! If you feel that this example and the practice I’m suggesting is not important, please reconsider. For not only do you most likely say “I’m sorry”, several times a day but there are many other examples of words that you’re most likely now using unconsciously, that are creating low frequency energy. In the days to come, become the witness as well as the participant in your life. Begin to notice the words you use, and the thoughts you’re holding about others and yourself, and then take a look to see if they carry high or low energy. Be an observer not a judge, as you take on this practice. If you should you notice that words you use sometimes carry low vibrational energy, make a commitment to shift your words. Identify consistent phrases, or expressions and begin to rephrase them in order for them to represent a higher vibration. I’m sure you are getting the idea by now how your words can be your building blocks as you seek to build an abundant life. You might even be realizing words or phrases that you use consistently that need to be transformed. I love how practical, spiritual practices can be. I love living a life from the state of abundance. I love how daily life gives us so many opportunities to shift our frequency into high vibrational mode. I love sharing information with YOU! In this master class you will discover the 4 blocks that keep people from abundance and 4 transformational practices that you can use immediately, that will empower YOU to develop an abundant life! You are most welcomed and thank you for your kind words Marilyn! Thank you for this work! I have resisted saying I am sorry many times. Now I know why! I appreciate your words! You are welcomed Ivan! I appreciate you taking time to reach out in gratitude! You are more then welcomed Linda! Agreed! We are often brought up in an environment at best by good people who simply didn’t have the understanding that always living inside the energy of “I am sorry” doesn’t truly serve. In some cases when we were belittled and told me weren’t good enough, “I’m sorry” takes on a completely different meaning. I love you accepting responsibility from abundance i.e.being grateful for another as they wait for us Etc..I’m so glad this teaching was of help to you and I so appreciate you taking the time to reach out and share your thoughts with all of us. If you bump into someone, is “Excuse me” appropriate? I am trying to very much pay attention to how I think about things before I say them.